Henry Lee III (January 29, 1756—March 25, 1818) was an early American patriot who served as the ninth Governor of Virginia and as the Virginia Representative to the United States Congress. During the American Revolution, Lee served as a cavalry officer in the Continental Army and earned the nom de guerre "Light Horse Harry." He was also the father of Confederate general Robert E. Lee. 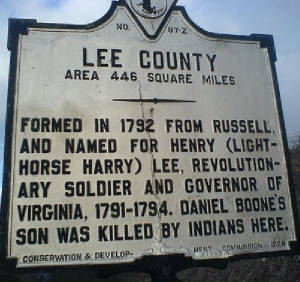 Henry Lee was born near Dumfries, Virginia, the son of Henry Lee II (1730—1787) of "Leesylvania" and Lucy Grymes (1734—1792) the "Lowland Beauty." His father was the second cousin of Richard Henry Lee, sixth President of the Continental Congress. His mother was an aunt of the wife of Virginia Governor Thomas Nelson Jr. His great-grandmother Mary Bland was a great-aunt of President Thomas Jefferson and he descended once from King John of England, twice from King Edward I of England, once from King Jean de Brienne of Jerusalem, twice from King Edward III of England and once from King Pedro I of Castile. Robert Edward Lee (January 19, 1807—October 12, 1870), the fifth child of Henry "Light Horse Harry" Lee and Anne Hill Carter (1773—1829), served as a Confederate general during the American Civil War. Henry Lee graduated from the College of New Jersey (now Princeton University) in 1773, and began pursuing a legal career. With the outbreak of the Revolutionary War, however, he received a captain's commission in a Virginia dragoon detachment, which was attached to the 1st Continental Light Dragoons. 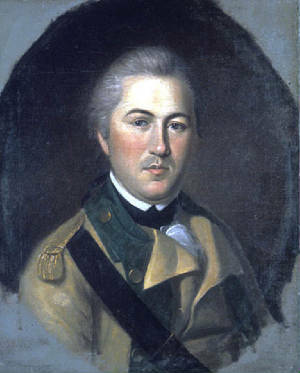 In 1778, Lee was promoted to Major and assigned the command of a mixed corps of cavalry and infantry known as Lee's Legion, with which he won a great reputation as a leader of light troops. As commander of said Legion, Lee earned the sobriquet of "Light Horse Harry" for his horsemanship. On September 22, 1779, the Continental Congress voted to present Lee with a gold medal–a reward given to no other officer below a general's rank– for the Legion's actions during the Battle of Paulus Hook in New Jersey, on August 19 of that year. Lee, promoted to Lieutenant Colonel, was assigned (with his Legion) to the southern theater of war. Lee's forces served and fought at the Battle of Guilford Court House, the Battle of Camden and the Battle of Eutaw Springs. He was present at Cornwallis's surrender at Yorktown, and, due to illness, was discharged from the Army. During the infamous Whiskey Rebellion, however, Lee commanded the 13,000 militiamen sent to quash the rebels. From 1786 to 1788, Henry Lee was a delegate to the Continental Congress, and in the last-named year in the Virginia convention, he favored the adoption of the United States Constitution. From 1789 to 1791, he served in the General Assembly and, from 1791 to 1794, was Governor of Virginia. In 1794, Henry "Light Horse Harry" Lee accompanied George Washington to assist and suppress the Whiskey Rebellion in western Pennsylvania. 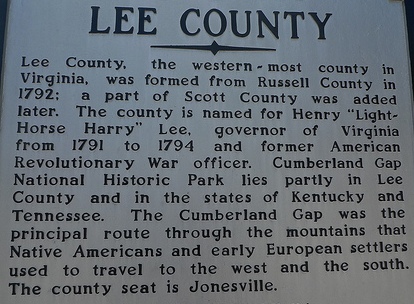 During Lee's governorship, a newly formed county in Virginia was also named in his honor. Lee, during his military career, had obtained the rank of major general in the U.S. Army (1798—1800). From 1799 to 1801, he served in the United States House of Representatives of the Congress. He famously eulogized Washington to a crowd of 4,000 at the first President's funeral on December 26, 1799—"first in war, first in peace, and first in the hearts of his countrymen." On July 27, 1812, Lee received grave injuries while protecting and resisting an attack on his friend, Alexander Contee Hanson, editor of the Baltimore newspaper, The Federal Republican. Hanson was attacked by a Democratic-Republican mob because his paper opposed the War of 1812. Lee and Hanson and two dozen other Federalists had taken refuge in the offices of the paper. The group surrendered to Baltimore city officials the next day and were jailed. Laborer George Woolslager then led a mob that forced its way into the jail and removed and beat the Federalists over the next three hours. One Federalist, James Lingan, died. Lee suffered extensive internal injuries as well as "head and face wounds," and even his speech was affected. Lee later sailed to the West Indies in an effort to recuperate from his injuries. 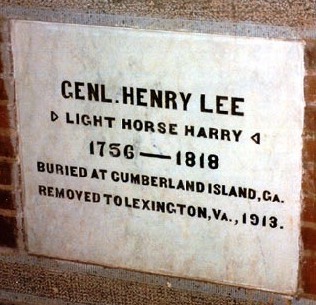 Henry "Light Horse Harry" Lee died on March 25, 1818, at Dungeness, on Cumberland Island, Georgia, and was buried with full military honors provided by an American fleet stationed near St. Marys. In 1913 his remains were removed to the Lee family crypt at Lee Chapel, on the campus of Washington & Lee University in Lexington, Virginia. But by 1809 Lee's fortunes had tragically altered: He wrote these memoirs while jailed in a debtor's prison. Originally published in 1812 in two volumes as Memoirs of the War in the Southern Department of the United States, this third 1869 edition includes Robert E. Lee's biographical essay on his father, the only substantial piece of writing by the celebrated Confederate general. From Grant and Sherman to Eisenhower and De Gaulle, classic military accounts have emerged from the carnage of nearly every war; Lee's Memoirs are unique in that they are unrivaled in the history of the American Revolution. This massive volume of more than 600 pages is comprehensive and engaging, and is a welcome addition to school and public libraries, students of the American Revolution and Colonial history, those interested in memoirs, and individuals that are interested in the Lee family. The first part of the book covers this portion of Lee's life. To me it was the most interesting, the Revolution in general and the Continental Army in particular being two of my favorite subjects. The rest of the book, however, covers Lee's later life, which declined steadily after the Revolution, with debt, sickness, failure, and an early death. Lee, the father of the renowned Confederate general Robert E. Lee, is an interesting, sad figure, egotistical, patriotic, more than competent, and somewhat politically naive. Royster presents Lee as a whole person, and deftly intertwines his tale with Revolutionary exploits, first hand accounts, family and financial problems, and brings the legend into line with the man's humanity, frailties, and strengths. This book is a must for all interested in the Revolution and one of the most fascinating personalities to grace the American stage in the 18th century. Unlike existing accounts, A Guide to the Battles of the American Revolution by authors Theodore P. Savas and J. David Dameron presents each engagement in a unique way. Each battle entry offers a wide and rich-but consistent-template of information to make it easy for readers to find exactly what they are seeking. Every entry begins with introductory details including the date of the battle, its location, commanders, opposing forces, terrain, weather, and time of day. The detailed body of each entry offers both a Colonial and British perspective of the unfolding military situation, a detailed and unbiased account of what actually transpired, a discussion of numbers and losses, an assessment of the consequences of the battle, and suggestions for further reading. Many of the entries are supported and enriched by original maps and photos. Fresh, scholarly, informative, and entertaining, A Guide to the Battles of the American Revolution will be welcomed by historians and general enthusiasts everywhere. Review: A Guide to the Battles of the American Revolution is a superior, thorough, and succinct work that illuminates the dawn of our country for future generations. The authors provide an unbiased and clearly formatted book that allows the reader to see the battles that shaped the Revolutionary War. This book can serve as a comprehensive review of the entire war, or can afford the reader with a reference for specific battles and leaders. The authors took great care to use current military terminology to add a modern context to events that occurred over 200 years ago. In this respect, I feel they are to be commended because readers of this outstanding book can relate our early struggles as a nation to events occurring today. Thoroughly enjoyable, great read, this book owns a special place on my bookshelf. About the Authors: Theodore P. Savas practiced law in Silicon Valley for many years before moving into the world of book publishing. He is the author or editor of many books (published in six languages) including A Guide to the Battles of the American Revolution (with J. David Dameron), Hunt and Kill: U-505 and the U-Boat War in the Atlantic, and Silent Hunters: German U-boat Commanders of World War II. He lives in El Dorado Hills, CA with his wife and children. J. David Dameron received his education at the University of North Carolina. He is retired from the U.S. Army, where he served with the 82nd Airborne Division and the 7th Special Forces Group. He is the author of several books including General Henry L. Benning (2001), Benning's Brigade, Volumes 1 and 2 (2002), Kings Mountain: Defeat of the Loyalists (2003), and A Guide to the Battles of the American Revolution (with Theodore P. Savas). Reader's Review: Whether or not Mr. Wilkins is a "revisionist historian" or not, (is complete objectivity really possible?) this book depicts a man who stands head and shoulders above military professionals throughout U.S. history. Nowhere have I read about a man of such faith, honor, integrity and humility than Robert E. Lee. Lee's greatness cannot be separated from his faith, because his character flowed from his faith. Trying to understand such a man apart from his relationship with his creator is impossible. Mr. Wilkins need not apologize for focusing on Lee's faith, for I believe General Lee would have wanted it no other way. I wish every newly commissioned officer in the U.S. military were required to read this book. Designed for the "armchair strategist" with dozens of detailed maps and illustrations, here is a blow-by-blow analysis of the men, commanders, and weaponry used in the famous battles of Bunker Hill, Quebec, Trenton, Princeton, Saratoga, and Cowpens. Venturing beyond the conventional list of generals and politicians, THE HISTORY CHANNEL® introduces the full range of individuals who helped shape this great conflict including some of the war’s most influential unsung heroes. Through sweeping cinematic recreations intimate biographical investigations and provocative political military and economic analysis the historic ideas and themes that transformed treasonous acts against the British into noble acts of courage both on and off the battlefield come to life in this dramatic and captivating program. This TEN HOUR DVD Features: History in the Making: The Revolution Behind-the-Scenes Featurette; Interactive Menus; Scene Selections. Reader's Review: The inaugural volume of the highly honored but still unfinished "Oxford History Of The United States" series is "The Glorious Cause: The American Revolution, 1763-1789," a superbly written, scholarly, and highly literate account of the America's War for Independence. Written by Robert L. Middlekauff, Professor of History... this is the finest account of the Revolutionary War I have found to date... even better than Benson Bobrick's "Angel in the Whirlwind," which I have already reviewed. "The Glorious Cause" is a comprehensive account of the American Revolution designed to give readers a well rounded overview of not only the causes of the war, but also of how the war was fought. The book succeeds admirably at its task. After finishing "The Glorious Cause," I felt a much greater appreciation for the men and women whose struggle for freedom brought forth on the North American continent a new and independent nation - the United States of America. "The Glorious Cause" begins by examining the causes of the American Revolution. In one of the book's earliest chapters, entitled "The Children of the Twice Born," Middlekauff carefully lays out his closely reasoned and well argued thesis: that the seeds of revolution were planted long before the war was actually fought. Those seeds, embodied in the economic, social, political, and religious fabric of American society, made the evolution to democracy on the North American continent almost inevitable. The earliest settlers came to the New World because of their disenchantment with authoritarian English laws and what they viewed as centralized, overly ritualistic, dogmatic Anglican religion. When the settlers arrived with their ideals of political and congregationalist religious democracy, they found land cheap and plentiful. Whereas only about 20 percent of all Englishmen were landowners, and hence were eligible to participate in England's parliamentary democracy, over 50 percent of American colonists owned land and therefore could take part in colonial parliamentary government. The result: provincial representative assemblies tended to do the bidding of their constituents rather than the royal governors. After the Seven Years' War, tension between American political and economic interests and the interests of the British government was exacerbated by Parliament's intent to restore British prerogatives in America. Tension was bound to lead to conflict, and that conflict wasn't long in coming. The American colonies were left pretty much to their own economic and political devices during the Seven Years' War, so long as they provided support for Britain's war against the French. The colonists bore the brunt of the fighting during the war against the French in North America; at war's end, they expected to be permitted to return to some semblance of self-government. It was not to be, however. Under Britain's new King and a Parliament with a new-found awareness of the American colonies' potential to enrich their colonial masters, Parliament began enacting a series of laws (Stamp Act, Townshend Acts, Sugar Act, etc.) designed to bring the colonies to heel. The colonists, thoroughly imbued with the ideals of democracy and liberty, rebelled, first through political means, and finally, inevitably, through violence. Once "The Glorious Cause" completes its assessment of the causes of the war, it takes the reader on a fascinating journey through the war itself. The way the American Revolution was fought is frequently shrouded in the mists of legend, with great American heroes standing tall against the overwhelming might of the British and Hessian armies. There are strong elements of historical truth to that legend, but Middlekauff does an excellent job of portraying the war exactly as it was: a very closely contested fight between colonial masters and those who wished to throw off the yoke of colonialism. There's really almost nothing to criticize in "The Glorious Cause." It is, in nearly every respect, an outstanding work of history. It's comprehensive in its scope; thorough in its approach; obviously very well researched; and imbued with careful, thoughtful, and incisive historical analysis. Middlekauff's descriptions of Revolutionary War battles are first-rate. The author completely captures the flavor of eighteenth century warfare in general, and of the battles of the American Revolution in particular. When I finished reading "The Glorious Cause," I felt as if I had actually been there at some of the great battles of the war. One very minor caveat: because "The Glorious Cause" takes a fairly academic approach to studying the American Revolution, the book's somewhat lofty and scholarly sounding language may not appeal to readers with only a passing interest in history in general, and the American Revolution in particular. That's not to say the book has only a narrow appeal to academics and history scholars, however; it is definitely written for the general reader with a love of American history. It will, in my view, prove a most satisfying experience for the vast majority of history lovers who decide to read it. "The Glorious Cause" is a winner of a book in every respect. With a dearth of excellent books about the American Revolution currently in print, this volume fills a crucial need for those who wish to learn about America's struggle for independence. As the inaugural volume of the "Oxford History Of The United States," "The Glorious Cause" also sets the tone for the whole series... highly readable, thoroughly imbued with first-rate scholarship and a polished, eloquent writing style; and simply a pleasure to read. Sources: Lee, Henry, and Robert E. Lee. Memoirs of the War in the Southern Department of the United States. Eyewitness accounts of the American Revolution. [New York]: New York times, 1969. (originally published 1812; 3rd ed. published in 1869, with memoir by his son Robert E. Lee); Hinde, Captain Robert (1778), Discipline of the Light-Horse, London: W.Owen; Fontaine, William W. The Descent Of General Robert Edward Lee From Robert The Bruce, Of Scotland; princeton.edu; "Lee, Henry". Encyclopædia Britannica (11th ed.) (1911); Papers of George Washington, Gwpapers.virginia.edu; Alexander Leitch, A Princeton Companion (Lee, Henry) (1978).